but it wasn’t until ’93 that he actually acquired a pair of turntables to practice on! In fact, the whole DJ thing happened totally by accident for the art student Hardnoyz, who was listening to Hip-Hop and running around with the likes of the infamous DAZ, Rich 87 & the FMA graffiti crew. It was at art college where he was persuaded to buy a ticket for a Sunrise (M25) Rave in June ’89 and Friday nights were religiously spent @ the Goldmine (Canvey). Pirate stations were being taped – Fantasy FM, Centreforce, then a college mate invited Hardnoyz to the studio (dusty garage) of this new local station set up by a DJ Navigator (aka DJ Vibes). By this stage (1990) Hardnoyz was buying tunes but having to go round mates houses to mix ’em. That’s when the DJing really started and before long he was being asked to play boat parties, private raves like Blundells Farm and slots on a Thurrock pirate called Joy FM. After leaving college for a uni degree course in London, Hardnoyz met a dorris who was friends with a Richard Nelson, brother of Matt (Slipmatt) and founder of Raindance, who asked him to do some warmup slots at Jenkins Lane. He was paid in over-sized merchandise which he sold on to his mates. Vibes started Technocore @ the Slammer, Gravesend (91-92) where Hardnoyz played alongside some soon-to-be big names (including Stetly) and was re-united with college pal Yardey Spangler on the mic. It was at this time (1992) Hardnoyz hooked up with The Rush Puppy who got him a residency at the Berwick Manor (Rainham) alongside himself and Roger Johnson. After the authorities kept busting these nights, the promoter threw in the towel and Hardnoyz found himself playing back2back sets with Rush Puppy at places like the Wax Club (Stratford). Hardnoyz now runs his own design company as well as performing Creative Direction duties for the digital distribution site Surus.co.uk. Also expect to see some new and exciting ventures including some radio appearances and even some bass music releases later this year (2013). 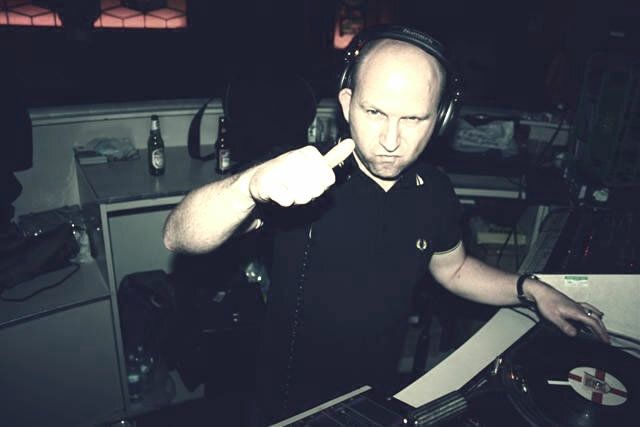 Seeing as he lost his hair 10 yrs ago, he now wears desert boots & Fred Perry’s and DJs oldskool Reggae, Ska and Soul as DJ Smudge to Skinheads, Soul boys (and girls), Mods up and down the country (find out more here). Hardnoyz would like to thank the Rave, Jungle, DnB scene for giving him some wicked memories (more like acid flashbacks) and some of the best lifelong friends an old git of a DJ could have!! !